From our 10 and 11 inch rear drum brake kits and our new aluminum finned drum brake kits, to Wilwood front and rear disc brakes. John’s got you covered! 10 inch Rear Drum Brake Kits The 10” kit is all about keeping it simple and affordable, which is sometimes the difference between finishing your project or not. All our drum brake systems are current production, replacement parts are available at any quality auto parts store, even on Sundays. Our 10” kit weights 45 pounds, which saves 20 pounds un-sprung weight over a comparable 11” kit. This makes for a better ride, handling and stopping. Ride quality improvement is comparable to the difference between aluminum wheels and steel wheels. This kit works well with manual or power boosted braking systems. Its all about keeping it simple! All kits come complete: 2 drums with required bolt pattern, backing plates, shoes, wheel cylinders, emergency brake lever, and hardware. This is the best street rod kit ever! 10 inch Rear Drum Brake Kits - Ford Small Bearing and Ford Big Bearing New Style 10” x 2 1/2” complete for the following styles (45 pounds complete) Ford Small Bearing 10″ X 2-1/2″ drums, 2.835 bearing, 2.50 axle offset, 2.775 center pilot hole, attaching bolt pattern 3.336 x 2 “. Ford Big Bearing New Style 10″ X 2-1/2″ drums, 3.15 bearing, 2.50 axle offset, 2.780 center pilot hole, attaching bolt pattern 3.562 x 2 “. 11 inch Rear Drum Brake Kits All kits come complete: 2 drums with required bolt pattern, backing plates, shoes, wheel cylinders, emergency brake lever, and hardware. 11 inch Rear Drum Brake Kits11” x 2 1/4” complete for the following styles (65 pounds complete) Ford Big Bearing Old Style 11 x 2 1/4” drums, 3.15 bearing, 2.36 axle offset, 2.880 center pilot hole, attaching bolt pattern 3.50 x 2.375“. Ford Big Bearing New Style (Torino style) 11 x 2 1/4” drums, 3.15 bearing, 2.50 axle offset, 2.780 center pilot hole, attaching bolt pattern 3.562 x 2”. Wilwood Engineering designs and manufactures high-performance disc brake systems. 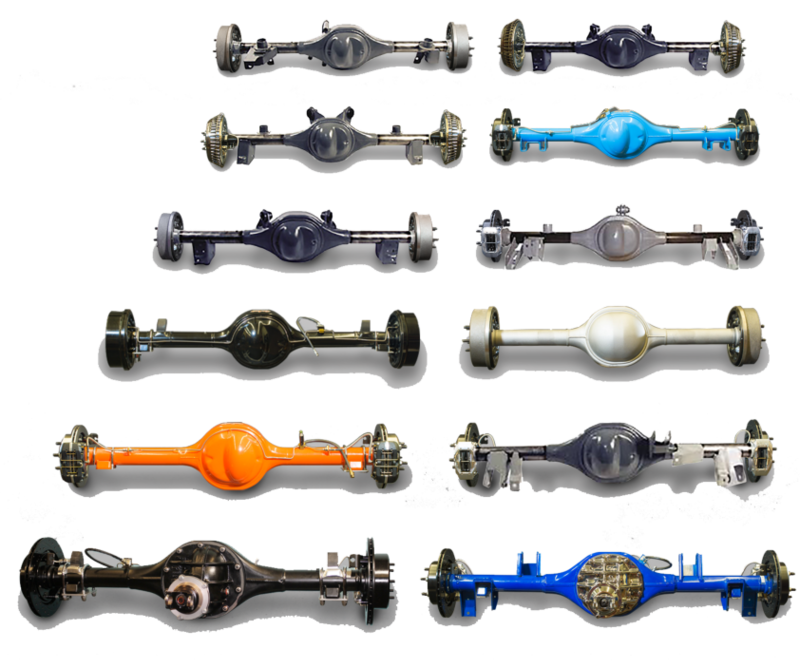 Wilwood’s core ability is the rapid development of custom engineered brake systems using a combination of off-the-shelf and custom components. Wilwood’s engineering department uses the latest computer-aided design and manufacturing techniques in conjunction with finite element analysis, dynamic test and cycle test equipment, to find high-performance and reliability solutions for the most difficult braking tasks. For pricing, click here. Check out the Wilwood site for details and come back to John’s to place your order. Click here for www.wilwood.com. Wilwood Engineering designs and manufactures high- performance disc brake systems. Wilwood’s core ability is the rapid development of custom engineered brake systems using a combination of off-the-shelf and custom components. Wilwood’s engineering department uses the latest computer-aided design and manufacturing techniques in conjunction with finite element analysis, dynamic test and cycle test equipment, to find high-performance and reliability solutions for the most difficult braking tasks. For pricing, click here. Check out the Wilwood site for details and come back to John’s to place your order. Click here for www.wilwood.com. Wilwood Engineering designs and manufactures high-performance disc brake systems. Wilwood’s core ability is the rapid development of custom engineered brake systems using a combination of off-the-shelf and custom components. Wilwood’s engineering department uses the latest computer- aided design and manufacturing techniques in conjunction with finite element analysis, dynamic test and cycle test equipment, to find high-performance and reliability solutions for the most difficult braking tasks. For pricing, click here. Check out the Wilwood site for details and come back to John’s to place your order. Click here for www.wilwood.com.